After being disqualified from fourth place by race officials after Saturday’s Isiklar Turkish Grand Prix for re-passing a turn marker, Team Abu Dhabi’s Rashed Al-Tayer and Faleh Al-Mansoori had hoped to bounce back strongly in Sunday’s second 16-lap race at the second round of the 2013 UIM Class 1 World Powerboat Championship at Pendik-Istanbul. After the dramatic incident-filled first race, the Team Abu Dhabi crew were holding fourth position at the start of the second race when they crossed the dirty water behind Fendi Racing 10 and the boat dug in and flipped in a terrifying barrel roll. 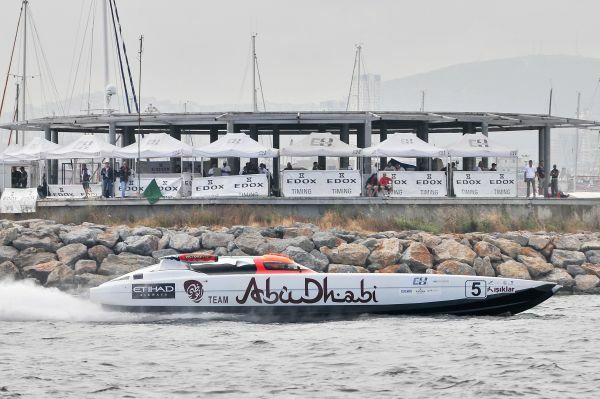 Neither crewmember was injured in the crash but it capped a disappointing weekend for the team, which runs under the auspices of the Abu Dhabi International Marine Sports Club (ADIMSC) and has the support of Etihad Airways as the team’s official carrier. The club runs under the chairmanship of His Highness Dr. Sheikh Sultan Bin Khalifa Al Nahyan. The Victory 3 crew of Arif Saif Al-Zafeen and Mohammed Al-Marri led from pole position and continued to lead after Team Abu Dhabi’s red flag incident. They eventually reached the chequered flag 22.45 seconds in front of second-placed Fendi Racing 10’s Luca Formilli-Fendi and Giovanni Carpitella. Hub Team Australia’s Darren Nicholson and Ross Willaton – winners of the first race on Saturday – finished third overall and Fendi Racing 8’s Alfredo Amato and Miles Jennings climbed through the field to finish fourth. Victory 3 now holds a slender lead in the championship heading to the next round in Italy in October. Disappointed to have been disqualified from Saturday afternoon’s race by event officials for re-passing a turn mark, the Team Abu Dhabi crew needed to refocus on the job in hand and ensure that they scored points in the second of the races on Sunday. A repaired Victory 3 dominated the morning’s shortened eight-boat practice session with a lap of 2min 37.04sec before attention turned to a second one-hour scoring qualifying session and the second race. Victory 3 claimed pole position with a lap of 2min 51.92sec and Team Abu Dhabi lined up in fourth position for the race behind Victory 3, Fendi Racing 10 and Hub Team Australia. Victory 3 led from Hub Team Australia through lap one and there was a neck-and-neck battle between Fendi Racing 10 and Team Abu Dhabi for third position. The pair were racing two abreast until the Emirati boat cut across the dirty water behind Fendi Racing and the front of the boat dug in and catapulted the crew into a frightening barrel-roll and instant retirement. Both members of the crew were uninjured in the accident, which forced the race to be red flagged. Victory 3 stayed out in front after the restart from Fendi Racing 10, Poliform and Hub Team Australia. The Dubai crew had extended their advantage to over 38 seconds after five laps, according to the inconsistent results, but Hub Team Australia moved back into second after six laps and had reduced Victory’s lead to 18.63 seconds, only to be passed again by Fendi Racing on the next lap. Victory 3’s lead over Fendi Racing 10 was 18.7 seconds after nine of the 16 laps and the winning margin grew to 22.45 seconds, with Hub Team Australia taking third. Only five of the eight boats finished.